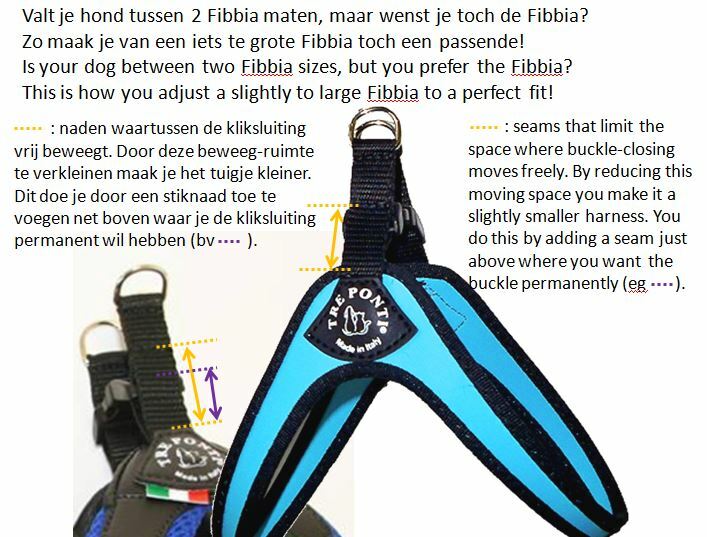 Ergonomic dog harness, the Fibbia has has a buckle closing. Handmade in Italy. The Fibbia has a buckle closing. These harnasses have the same principle as the Liberta, but with limited tolerance. The advantage of the Fibbia is that your dog can run free with this harnass. The Fibbia is not adjustable in size. Therefore it is possible that your dog may just fall between two sizes (see below for further explanation). The weights are, of course, an average indication. The ideal situation is that the dog can fit the harness so that we can see what size is best, and also what type of Tre Ponti harness best suits the figure of the dog. Can not you come into the shop in Antwerp, you can always ask our assistance via e-mail. Do add the weight of your dog and the girht/chest size. Because of the ergonomic design irritation or friction in the armpit (front legs) is impossible. This combined with the unlimited movement freedom makes the Tre Ponti harnasses also suitable for dogs sports (Flyball, Agility, Cycling, etc.). Is your dog between two Fibbia sizes, but you prefer the Fibbia? Don't fix the buckle all the way at the bottom, because then there will be too much pressure on the closure/buckle. For the same reason it is best not to apply this method to sizes larger than size 3. As indicated above, some dogs fall between 2 sizes if the harness does suit their build.